Tyler Smith (6) drops back to pass against Sulligent as Levi Cannon (22) and Isaac Darty (34) block. The Berry Wildcats began its 2018 football campaign by hosting the Class 2A Sulligent Blue Devils for the first time since 2007. The Wildcats and Blue Devils played a close game, with both teams bitten by the turnover bug. In the end, Sulligent escaped with an eight-point victory. Berry won the toss and elected to defer to the second half. The Blue Devils returned the kick to the Sulligent 27-yard line to begin play. 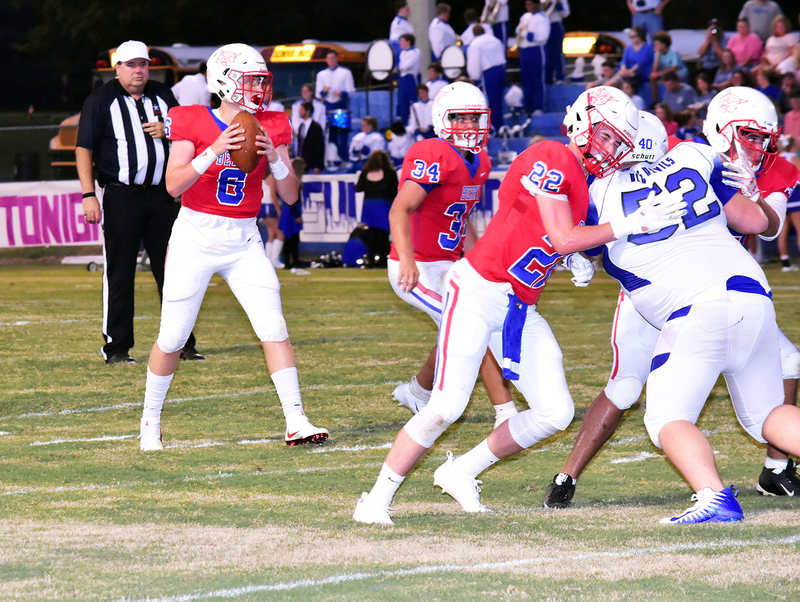 On the third play from scrimmage, Sam Franklin intercepted a Blue Devil pass and returned it to the Sulligent 37-yard line to get the Wildcat offense on the field for the first time.